If we’ve learned nothing else from Michigan’s recent wolf management debate it is that when conflicts arise between humans and wildlife, it is in the best interest of both parties to at least create a sense that a plan is in place for peaceful coexistence. This issue of social acceptance is especially critical for species which find themselves near, or at the top of a food web. After all, no one likes unregulated bullies at the top of a food chain. Absent such measures, human resentment of wildlife species for doing nothing more than what they’ve evolved to do (eat, breed and expand) can increase to a point where they are viewed not as a wildlife recovery success story but as a failure of wildlife species protection measures. Enter, the Double-crested Cormorant (DCC). The shocking explosion of their numbers is vividly recalled from 2008 during our annual May trip to Beaver Island. Although certainly not a scientific basis of comparison, my observations were based upon a frame of reference which spanned nearly two decades at the same lake during the same week of the year. What was unique during this visit was the seemingly organized assembly of scores of cormorants in marching band-like formation – diving and feeding and in all likelihood well on their way to their average 1.25 pound per day of fish consumption. During that same time, age-classes of some fish species in this area appeared to either be missing, or greatly reduced. It seems hard to believe that it was just 40 years ago that Great Lakes DCC numbers had collapsed. In 1972, they were added to the list of species protected by the Migratory Bird Treaty Act and became just one more victim of the worsening health of the Great Lakes. Over time, wildlife conservation measures and the steady reduction in levels of DDT resulted in the resurgence of their numbers to what became historic highs. Although most researchers believed that DCC population levels would eventually stabilize (as is the case with most wildlife species), the effects that the birds were already having on fish species and island nesting habitat was increasingly found to be too deleterious to be left unaddressed. In addition to their voracious appetites, DCC nesting sites and habits were increasingly displacing other wildlife species and their highly acidic excrement kills roosting trees, shoreline vegetation and defiles beaches throughout the northern Great Lakes. Beginning in 2004, an effort to address these compounding issues was initiated. A partnership program was subsequently formed under the leadership of the USDA’s Michigan Wildlife Services Director, Peter H. Butchko. 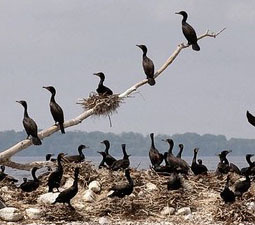 State and federal wildlife agencies, together with sportsmen, conservation groups and Tribal leadership developed plans to mitigate the impact cormorants were having within the framework of their protected species status. As early as 2009, evidence began to mount that these closely controlled measures were having a positive impact. Estimates for the Les Cheneaux Island area indicated that the cormorant population was reduced by 15 percent the first year alone. Although it is difficult to measure how much of the Les Cheneaux Island perch fishery recovery resulted from environmental factors and how much from reduced cormorant predation, MDNR fisheries biologists recognized that recent age classes were living longer and population recruitment was up. This was a departure from what had been occurring when cormorant numbers were at their peak. Similar reports have also emerged from the Beaver Island archipelago where smallmouth bass numbers have also seen a measurable recovery. It should be emphasized that all of this has been accomplished in a manner at levels which continue to provide even the casual birder ample opportunities to see these birds. In my view, these measures are also in the best interest of the Double-crested Cormorant. Nature has repeatedly shown us that wildlife species which expand at rates which exceed their long-term sustainability and into areas beyond their historic native ranges will ultimately suffer the consequences. 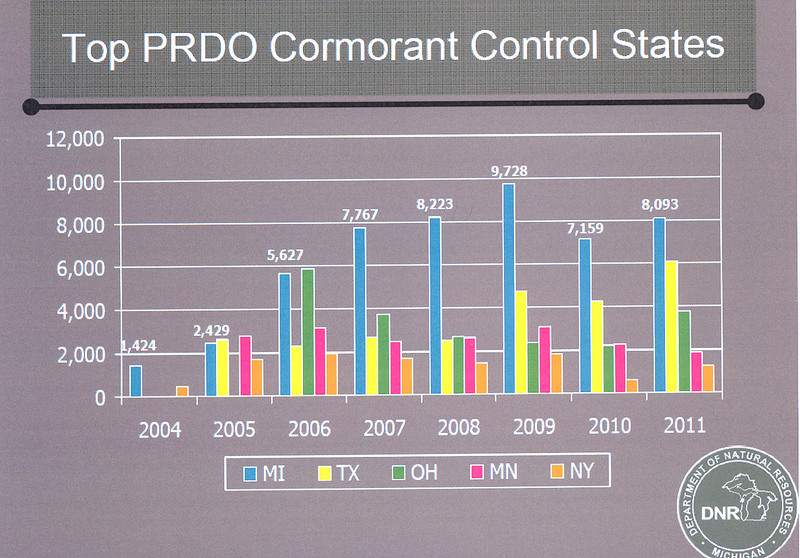 The graphics associated with the 2012 DCC management update presented at the Michigan Natural Resources Commission meeting on May 9, 2013 can be view by clicking here.